Since the heavy rains in SEQ the Condamine Gorge (The Head) has changed from a good trip in a soft roader trip to needing good 4x4. The water has moved large rocks around in the river which will need to be walked on many of the crossings. 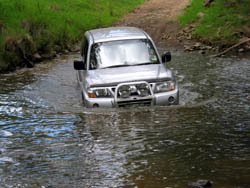 Charging into the river will cause damage as one RAV4 found out by cracking its fuel tank. It requires low range and steady as it goes. The orginal road in many placed is rough and some parts have new tracks around blockages. This track needs recovery vehicles especially in some of the river crossings as large rocks can cause you to get hung up. The water level is deep in some places and water bra or snorkel is advised.